This 24 x 36 Frame is in Stock & Ready to Ship. Versatile Design Accommodates Vertical & Landscape Prints. 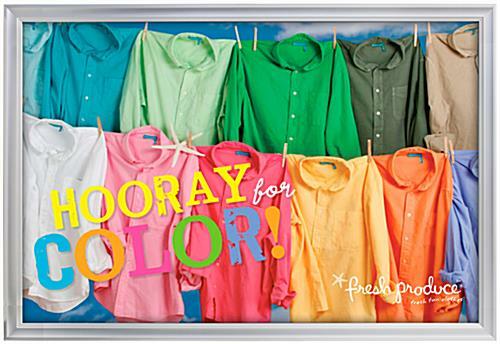 This 24 x 36 Frame is Great for Commercial Locations. Single-sided slot allows users to keep the frame in position at all times. 24 x 36 measurements are common; no custom size printing required. Mounting holes are positioned at the backside of the frame for anchoring to a wall. Plastic overlay protects artwork from dirt & fingerprints; prevents signs from slipping out the front. 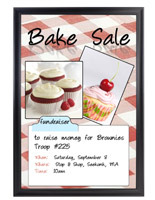 This 24 x 36 frame uses a slide-in design for quick signage changes. 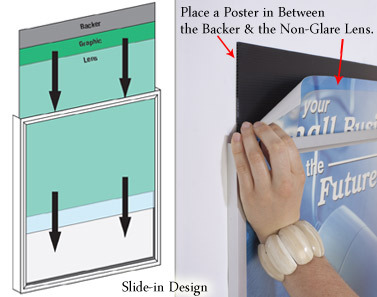 The wall-mounted poster holder differs from most picture framing units because of the opening along one side. Once set up, the silver 24 x 36 frame can remain on display when inserting new signage. To update signage, simply pull out the existing poster through the channel along the edge. Sandwich a new sign in between the backboard and the non-glare lens and insert the three pieces back through the opening. 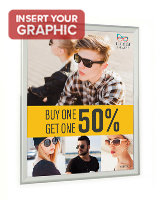 This wall-mount 24 x 36 frame, also known as picture framing, does not need to be removed from its location, thus minimizing the amount of time needed for changing signage. Hardware and anchors are included with every purchase for effortless installation. The screws are threaded through the framing, which creates a stable connection. This 24 x 36 frame that holds a 24x36 poster, can display either a vertical or a horizontal print. Please note that when showcasing an upright graphic, the open side must be on the top of the unit to prevent signage from falling out of the bottom. 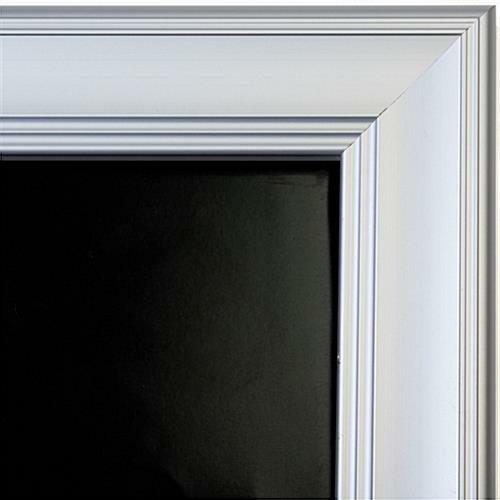 This 24 x 36 frame that attaches to a wall features decorative detailing along the 1-5/8" wide aluminum profile. While subtle in style, the silver framing beautifully borders a displayed advertisement. This 24 x 36 frame that has a slide-in structure works well in commercial environments, such as within a retail store, hotel or restaurant. Frequently updating signage, which is standard practice in business locations, has never been easier! 26.6" x 38.6" x 0.8125"